Liquid Oxygen contains hydrogen peroxide (H2O2) which is a highly unstable molecule. It will quickly break down in the nutrient tank releasing a free atom of oxygen. This oxygen atom is extremely reactive and will attach itself to either another atom, forming a stable oxygen molecule, or attack a nearby organic molecule, such as a virus or fungal spore. Liquid Oxygen can eliminate existing diseases and help to prevent future ones. A daily addition of Liquid Oxygen to the nutrient tank will invigorate the plant and increase nutrient uptake, leading to faster growth rates. In plants the extra oxygen provided will massively stimulate protein production at the cellular level. This will greatly enhance the photosynthetic process, leading to bushier plants with larger leaves, thicker stems and shorter internodes. Plants will be stronger and leaves will be darker, thus collecting light with greater efficiency and further improving photosynthetic response. Liquid Oxygen adds extra ions of pure oxygen to the nutrient tank – regular use leads to enhanced growth rates. Liquid Oxygen helps to control root diseases and pathogens right in the tank – uninterrupted growth means healthier plants. 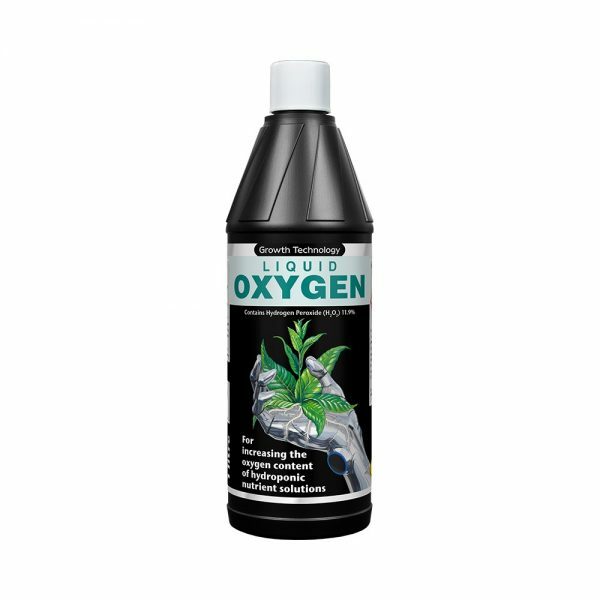 Liquid Oxygen can be used, at a higher concentration, to clean and sterilise hydroponic systems between crops as well as pots and benches in the greenhouse or elsewhere.